Glaucoma is a disease of the optic nerve that can cause blindness if left untreated. There are no symptoms in the early stages of the disease. 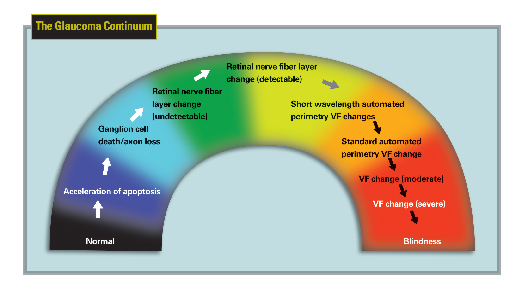 We have a glaucoma clinic quarterly using an optical coherence tomographer (OCT), which measures retinal nerve fiber layer thickness. In glaucoma the nerve fiber layer thins before a visual defect occurs. So we can now diagnose glaucoma earlier than before and thereby start treatment earlier to help prevent blindness. For more information go to http://www.reviewofophthalmology.com/CMSImagesContent/2004/11/1_625_0.jpg If you have been told you are a glaucoma suspect or have glaucoma, you should call the office at (760) 942-3937 and ask for an appointment.